A floating resort with all the amenities. 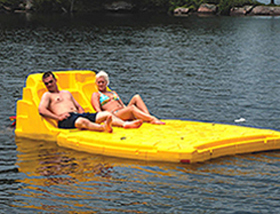 Kids and adults alike will love taking a mini-vacation on this large 8′ x 10′ water & swim raft. Available in yellow with blue table and seats or beige with green table and seats. Raft weighs 300 lbs. and has a 3000 lb. load capacity. Storage space beneath seat backs. Flip-up Aluminum ladder for easy storage. Molded-in handles & rope hitches around entire raft bottom. Recessed reflectors on all sides. Adjustable seat backs sit up or lay flat. Rounded corners & pontoon style bottom. Pop-up table with beverage holder. 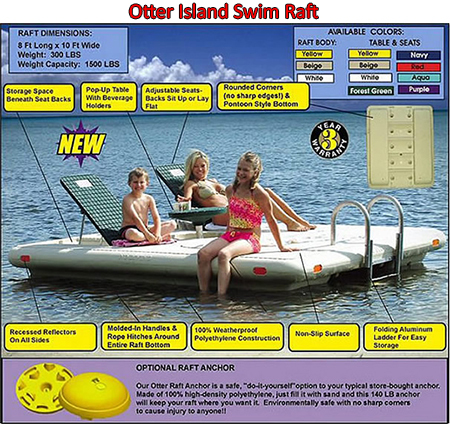 Rip Raft: 7.5′ x 7.5′ x 9″ high with 1,200-pound capacity. Raft weight is 165 pounds. Reflectors are on all four corners for safety. 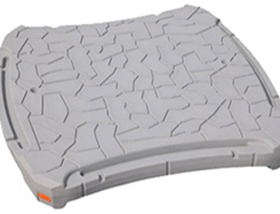 Durable anchoring system and non-slip deck surface. Available in tan, grey and yellow colours. Rock attachment: 3′ high with 2 corner reflectors. The modular design allows it to attach directly to the Rip Raft. Includes integrated cup holders. Available in tan, grey and yellow colours. 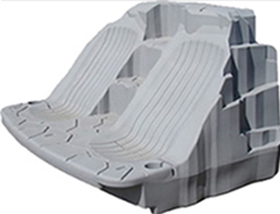 State of the art comes to swim rafts in this one-piece all-poly swim raft from ShoreMaster. Large 7.5′ by 9.5′ non-skid deck surface One-piece all-poly swim raft 3000-pound capacity Raft weight is approximately 325 pounds. Available in yellow, grey and tan. Reflectors on each corner and the 3-step aluminum ladder provide additional safety. Make a perfect 8 x 8 swim raft which is sure to keep kids busy for hours. Molded in beautiful sandstone, this float matches perfectly with Techstar’s ladders and dock stairs. A simple 2 x 6 frame requires no corner brackets as it bolts right thru the floats. There is however a molded hole to attach an anchor bracket thru to your frame. Dock bumpers are built in as part of the float. Foam filled with closed cell EPS (expanded polystyrene) for added security. 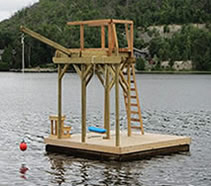 Your wood frame, hardware and decking stay out of the water. Polyethylene is environmentally friendly, as well as gasoline and wildlife resistant. Construction is simple. Build a frame without corner brackets and attach floats through molded bolt holes. Build with a 2 x 6 frame and 2 x 6 deck boards can recess in the top of the floats for a clean finish. Create your own fun with a custom swim raft built to suit your needs. 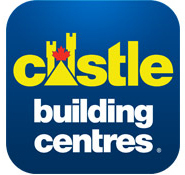 Docks & Decks Unlimited Inc.
Docks & Decks Unlimited Inc. provides outstanding workmanship for installation and service to the North including Estaire, Killarney, Britt, Pointe Au Baril, Markstay, St Charles, French River, Noelville, Sturgeon Falls, North Bay, Kukagami, Capreol, Penage, Espanola, Little Current, Gore Bay, Manitoulin Island, Elliot Lake, Massey, Blind River, Spanish, and Alban. Copyright 2014 Docks & Decks Unlimited Inc.
Sudbury Shop: 1794 Pioneer Rd.